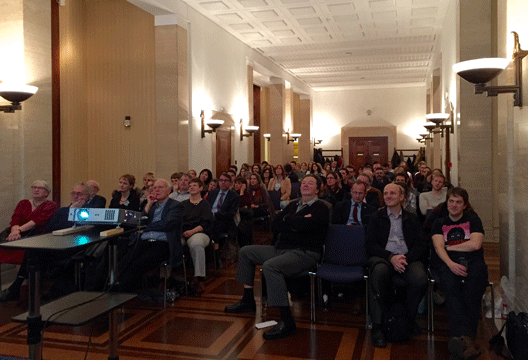 We report from our first Research Digest live event, celebrating 10 years of the blog. For a decade, the British Psychological Society’s Research Digest blog has been sharing the latest peer-reviewed research with an ever-growing, international audience. In its birthday year it pushed 900,000 page views in a month and topped the iTunes social sciences podcast chart with ‘PsychCrunch’. This event in London (kindly supported by Psychology Press) gathered 130 of the finest minds, including the researchers and bloggers who have conducted and shared much of that work, to celebrate and to discuss ‘Psychology heaven and hell’. After describing the richly layered personal traits that made the evening’s guest speakers instant choices, Sutton introduced Dr Christian Jarrett. ‘Just look at that angelic face! But then, in the words of the film The Usual Suspects, “the greatest trick the devil ever pulled was to convince the world he didn’t exist”.’ The evening was to follow the structure of the thousands of journal articles Jarrett has digested over the years, with him picking up the ‘Method’ of being a science writer. One of those psychologists, Professor Andy Field (University of Sussex), took the baton to discuss ‘Results: Is Psychology Damned to Hell?’ Null Hypothesis Significance Testing came under fire as Field’s personal hell: ‘it tells us nothing about importance because p depends upon sample size; it provides no evidence about the null (or alternative) hypothesis; and it encourages all-or-nothing thinking’ (nicely illustrated by the despair of researchers seeing ‘p > .05’ results churning out of SPSS). ‘Psychology heaven, in terms of getting a professorship, is doing lots of really large studies: you’ll get significant effects regardless of the actual importance of what you’re looking at’. Professor Field also pointed to other assumptions about our data which should, but very rarely do, lead to the adoption of robust methods of analysis. Using Ioannidis’ idea of ‘Positive Predictive Value’ – the post-study probability that a significant finding reflects a true relationship – Field then showed that psychology is vulnerable to ‘dodgy’ findings. A number of exploratory effects are often tested; research designs usually have considerable flexibility, in that there are often a number of different methods which can be used to measure an effect; sample sizes and effect sizes are often small; research may well be on ‘hot topics’; and academic prejudices can play a part. Replication is clearly key to trustworthy science, but Field questioned whether researchers’ attitudes around this are currently rather self-serving and defensive. In fact, finding the unexpected is Professor Frith’s idea of psychology heaven. Quoting William Blake’s ‘The Marriage of Heaven and Hell’, she said ‘Without Contraries is no progression.’ A cautionary proverb for psychologists was perhaps there in Blake’s line, ‘I have always found that Angels have the vanity to speak of themselves as the only wise; this they do with a confident insolence sprouting from systematic reasoning.’ The key, Professor Frith said, is to always ask ‘Why?’ when you are conducting a replication: a failed attempt to replicate can still push our understanding forward. Using examples from the Research Digest, Professor Frith gave ‘heavenly’ examples of when folk psychology appeared to be overturned. ‘Consigned to hell’ were ‘blaming parents’, ‘ignoring genetic evidence’, ‘conducting fMRI studies just because you can’, and ‘atheoretical research which is just fishing’. Professor Frith concluded with a call for more ‘slow science’ (‘test more subjects, do more trials, be more careful’), and for science communication to educate and build trust in psychology. Returning one last time to the ‘heaven and hell’ theme, she advised: ‘We need to always see two sides: this is the way to understand the mind… We need the big picture, and we need to go underneath into deep thought’. - Visit the Research Digest blog and join 37,000 subscribers to the free fortnightly e-mail. See also our preview of the event which includes links to the speakers and to more ‘heavenly’ and ‘hellish’ psychology. Finally, look out for BPS President Professor Jamie Hacker Hughes’s account of the evening, on his Presidential blog.